This code is a MATLAB script that can be used to design and analyze Sun-synchronous orbits. 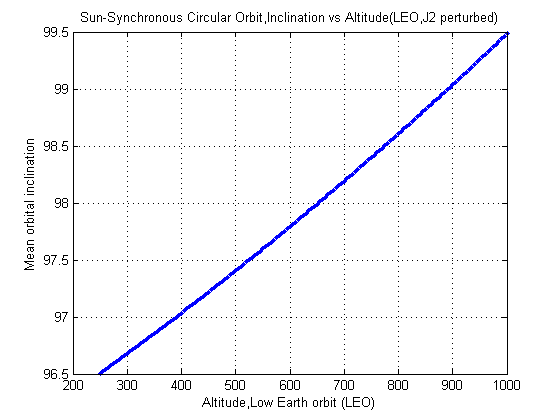 A Sun-synchronous orbit is a geocentric orbit which combines altitude and inclination in such a way that an object in this orbit has an a nodal regression rate which is equals to Earth’s orbital rotation speed around the Sun. The object in this orbit constantly illuminated by the Sun. By smallsat in Space Flight/Orbital Mechanics on April 11, 2013 . Always in the sun? Is that certain? From my understanding, the nodal regression is about ~1 deg/day. Therefore, the beta angle you launch into would be about constant. If you launched into a beta angle that was close to ~70 to 90 (dusk or dawn), then I can see not having an eclipse. But if you launch at Noon…then you would have a 0 beta angle…and your max eclipse time of close to 30 minutes (~1/3 of an orbit). Or thereabout. Hi William, I am working on a project which involve studies about sun synchronous orbits, and I believe what you said is correct. Sun synchronous orbits have a constant Beta angle. So, if the Beta angle is close to +90° or -90°, it would mean constant illumination. A Beta angle of 0° will have maximum eclipse time.